It makes me a little mad to find that artwork of mine, and other artists, that we share online for others to enjoy is just taken by unscrupulous, unethical, uncaring people for their own end or profit. Someone via Etsy asked if I could make my ‘Fly Away’ dragonfly design available so they could purchase it and used it for some needle felting. 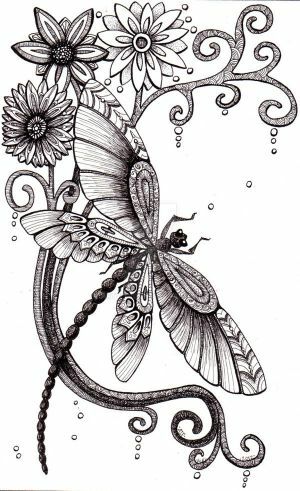 So, I looked for it via Google as I wasn’t sure which dragonfly design it is, or even if I still have it as I have sold some of these pieces of art in the past. Sadly, http://www.askideas.com doesn’t seem to let images from their website appear on other websites. That figures. I have ranted about copyright infringements before. It’s nice people like my work. However, I own the copyright and the only polite thing to do is to get in touch and ask for permission to use the image. In this case, I don’t have this image for sale on Etsy as a coloring template or a digital download to use for other artistic activities, such as needle felting the design or embroidering it. If I did, it wouldn’t cost very much, maybe a couple of dollars. Sometimes, when people approach me nicely, I may give permission for an old piece of art to be used in this way, so long as it’s a one off use, not to be sold on, for personal use and pleasure. If it’s to be sold, then there’s a fee involved. I put a lot of time and effort into my art, I’ve put a lot of time and effort over the last 20 or so years in refining, honing, developing, exploring my artistic skills. Yes, they are skills. I wasn’t born with them, I’ve had to work hard to develop those skills, just as everyone else has to who is good in their field, and I am fairly good, but I work at being the best I can be at any one particular time. I do this full time as my career now. I’m lucky enough to enjoy my career, my job so that sometimes I have to pinch myself to remind myself I do have a job, I am working, especially when I’m walking around, taking photos, drinking tea, writing, sketching on a trip out mid-week when everyone else is in work. My job really overlaps hugely with my pleasure. That doesn’t mean my work is free. I have bills to pay too. Everytime someone steals my art someone steals the potential for me to earn, whether they are stealing it directly from my websites or whether they’re using it from a website where the stolen art has been used. It would be like me going up to your boss and demanding that they pay me some of your salary just because I saw you working and liked what you did. Would that be fair, ethical, right? But that is exactly what people are doing when they steal art from artists, and others use that without checking the provenance of the image and whether it’s ok to use or whether they have to seek permission to use it. Sharing art to say ‘look at this I like this one by (artist’s name and/or a link to their website)’ is one thing, and that in itself is not bad at all. In fact artists appreciate it greatly. Sharing art to say ‘here download this and I get paid by the adverts on my site you view, or the money I ask you pay for the image use’ is wrong unless you have permission, an agreement with the artist. Telling someone that they’ve done a good job and you appreciate them is different to telling them that then taking some of their wages from them for telling them that they’ve done a good job. Art is my love, but it’s also my career. I rarely create art ‘for free’ – there has to be a really, really, really exceptional reason why I do this. The only regular ‘art for free’ I do is for the Angela Porter’s Coloring Book Fans facebook group with the monthly coloring template, and there are some very clear terms and conditions on the use of those templates. Now I’m not naive enough to think that everyone in the group follows those guidelines, nor do I have enough hours in a day to chase down all copyright infringements. These happen because I, foolishly perhaps, share my artwork on the interwebs. However, when I do find a copyright infringement, I do chase it up, if it’s possible to do so. And I leave a comment that the artwork has been stolen, hoping that people will take notice and not use it. In the same way, I’m not expecting a response from this website. I just have to let this go, but that rankles greatly too. I’ve learned how to watermark my art to show the copyright is mine along with my name and website. I rarely ever post just black and white drawings, unless I’ve watermarked over them or coloured the background in in some way. I don’t know what else I can do to protect my intellectual property rights and my income.